← “Да живее народната власт”? Щеше да е смешно, ако не беше жалко. I am celebrating a milestone on April 3rd 2018: my 50th birthday! I was born in 1968 in Skopje, Macedonia, and only a month later my family had to find political asylum in Bulgaria, where I grew up to become the person you all know. I grew up in a family of poets and writers. 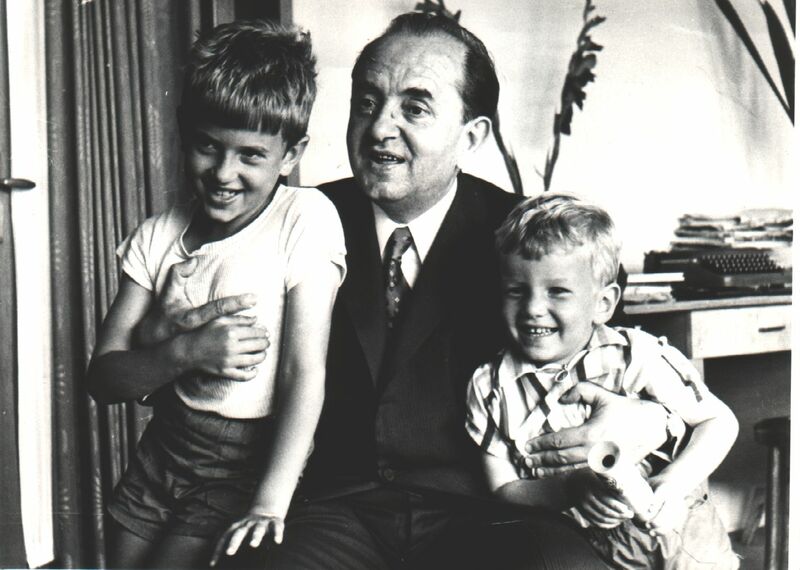 My Grandpa Venko was a poet, on the picture I am with him and my brother, Igor, and my Dad, Mile, was a writer, who passed away, when I was 7, and he was just two days shy of turning 36. My Mom was an editor at a children’s magazine, and my brother turned to be an actor and TV/radio anchor. After this intro, it is obviously a surprise that I turned away from poetry and decided to dedicate a large part of this half century – my life! – to the Internet. I took upon some initiatives, where I was either the first, or among the first folks in Bulgaria, who wanted to make the Internet a place that is open and free for all to enjoy. We succeeded far beyond our expectations. Bulgaria today has couple of thousands of Internet Service Providers, and among the fastest Internet connectivity of the European Union, yet at the lowest prices. I believed and continue to believe that only through an open Internet can we to foster an informed, inclusive, and thriving society. I deeply believe that today’s information technologies hold a massive promise for the realization of human rights. Millions of us now bear witness and have the tools at our fingertips to tell our stories and to change the world. But, today, many brave citizens and marginalized communities who speak out against repression and violence face powerful forces and grave risks. They are targeted, their stories denied or not trusted and their carefully-documented accounts of human rights crimes may be deleted by a tech giant’s algorithms. And people who share these stories in order to counter hateful and discriminatory narratives, are also at risk. I have never shied away from taking on a big challenge. This is why I am dedicating the proceedings for my 50th birthday via Facebook to go to WITNESS.org – a small, but mighty global network of activists, who are dedicated to helping anyone anywhere use video and technology to defend and protect human rights. WITNESS works alongside vulnerable communities providing vital training, guidance and tools to make defenders safer and ensure that their stories have the concrete impact they hope for. WITNESS also advocates on their behalf to the tech giants to make their platforms work better and safer for activists anywhere. The organization is the world’s leading partner and innovator when it comes to video and human rights. You can donate via this Facebook page (you can do it, even if you are not using Facebook! ), or directly at WITNESS’ web site. Don’t forget to click on “Dedicate my donation in honor or in memory of someone” (under the amount) and put my name there. My birthday wish is to help WITNESS’ guidance and resources reach every person who is bravely standing up against abuse, and working to build a better world. My birthday wish is to support and empower marginalized communities around the world to tell their truths, safely and effectively. My birthday wish is for WITNESS to excel in its pioneering role to make new technologies work for human rights. I am only turning 50 once! So this my case for support! WITNESS is half my age – they just celebrated their 25th anniversary. And, like me at that age, has proven track record. However, as I did at that age, they need resources to expand its reach and respond to the huge demand for its help. See also this TED video: “The power of citizen video to create undeniable truths” by WITNESS’ Executive Director and my friend Yvette Alberdingk Thijm for an overview of WITNESS’ groundbreaking and collaborative work. For 25 years, WITNESS has stood up for the truth. They were among the first to recognize and point out the dangers posed by fake media reports and false context surrounding images. Long before fake news became a buzz-worthy issue, WITNESS was developing solutions and working to ensure that human rights accounts could be trusted and government propaganda (overt and covert) challenged. This entry was posted in Bulgaria, in English, Personal. Bookmark the permalink.